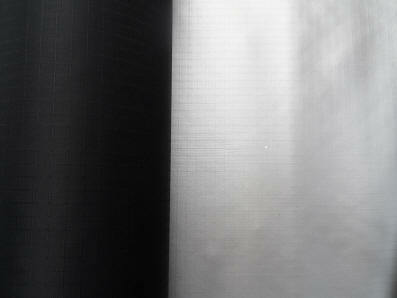 DIFFERENCE BETWEEN 1STS AND 2NDS ON SILNYLON: We sell a hundred yards of 2nds to every 1 yard of 1sts. Every now and then it may be slightly dirty or there may be a mark in the fabric or there may be an extra amount of silicone in the form of a narrow, whitish streak. In other words there may be minor cosmetic imperfections. Weights per sq yd can vary some from roll to roll as some rolls may have a heavier coating. We won't sell any silnylon that we feel is structurally compromised unless you know about it ahead of time. IN THE DECADES THAT WE HAVE STOCKED THIS FABRIC WE HAVE NEVER HAD A RETURN DUE TO ITS PERFORMANCE. WHY PAY MORE -- SAVE MONEY!!! WT/SQ YD=approx 2.33 oz 100% nylon fabric with a polyurethane coating and a durable water repellent (DWR) finish. Small reinforcement grids on fabric generally makes it more tear resistant than coated taffeta. Has an ultraviolet finish. If you don't need a fire retardant finish like the #1014 below, this is a very economical alternative that has great performance. (currently out of stock until? Light X-Pac. WT/SQ YD = 4.2 oz. Waterproof, 30/40 denier double ripstop nylon with black polyester X-Ply reinforcement threads at 22 degrees. .25 mil PET film with a 50 denier polyester taffeta backing making it more abrasion resistant on the inside of your project. Also has DWR finish on face fabric. This fabric is currently available in 2 different finishes a firm finish (a stiffer feel) and a soft finish (more flexible) depending on the needs for your project. Standard X-Pac. WT/SQ YD = 4.8 oz. Waterproof, 70 denier double ripstop nylon with black polyester X-Ply reinforcement threads at 22 degrees. .25 mil PET film with a 50 denier polyester taffeta backing making it more abrasion resistant on the inside of your project. Also has DWR finish on face fabric. This fabric is currently available in 2 different finishes a firm finish (a stiffer feel) and a soft finish (more flexible) depending on the needs for your project. Terrain X-Pac. WT/SQ YD = 6.0 oz. Waterproof, 210 denier double ripstop nylon with black polyester X-Ply reinforcement threads at 22 degrees. .25 mil PET film with a 50 denier polyester taffeta backing making it more abrasion resistant on the inside of your project. Also has DWR finish on face fabric. * = a soft style but with a medium hand "feel"
Terrain X-Pac. WT/SQ YD =apprx 6.0 oz. Waterproof, 250 denier polyester face fabric with black polyester X-Ply reinforcement threads at 22 degrees. .25 mil PET film with a 50 denier polyester taffeta backing making it more abrasion resistant on the inside of your project. Also has DWR finish on face fabric. 1-15 YDS 15 YDS-ROLL SZ ROLL SZ NEW! WT/SQ YD=approx, 5.9-6.4 oz. 200 denier 100% nylon with a special coating on the backside that can be bonded to itself using a household iron making the seam and fabric waterproof. Note: all of these fabrics are listed as waterproof but only the black is air tight. Uses: dry bags, packs, luggage, spray skirts. Instructions how to use heat sealable fabrics Wash Code= 1 Instructions for making a dry bag DIY Custom Dry Bags.pdf (these instructions are courtesy of our customer Brian Hunter). WT/SQ YD=apprx. 5.2 oz. 70 denier 100% nylon ripstop with a special coating on the backside that can be bonded to itself using a household iron making the seam and fabric waterproof. RF/US weldable. Fabric is waterproof and air tight. Uses: dry bags, packs, luggage, spray skirts. Click here for Instructions how to use heat sealable fabrics and here for instructions for making a dry bag DIY Custom Dry Bags.pdf (these instructions are courtesy of our customer Brian Hunter). Note: the cuben tape weighs approximately 2 grams per yard without cellophane backing.